Cheryl Bonner from Penn State Alumni Career Services will be visiting our area and will be available in answer any of your career questions. In addition, a panel of experts will be sharing their insights on the career landscape in the Bay Area. This evening will feature amble networking opportunities, food, door prizes and even some Penn State swag. Wanting to grow your network? Remember - "It is who you know". This is a great opportunity to reconnect with other Penn Staters and meet new people to grow your network. PeopleGrove will be the site of our event. 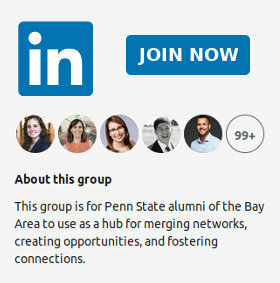 Powering the Penn State LionLink alumni and student networking platform, Alumni Career Services has partnered with PeopleGrove to provide Penn State students and alumni access to a community and the connections needed to succeed.